Confusing unit prices are costing consumers time and money. According to the label on the shelf, the unit price of Sorbent Facial Tissues was $408.57. At that price, they may be the most expensive tissues ever made. Not surprisingly, the figure was wrong – and it wasn't the only problem we found with supermarket unit pricing. 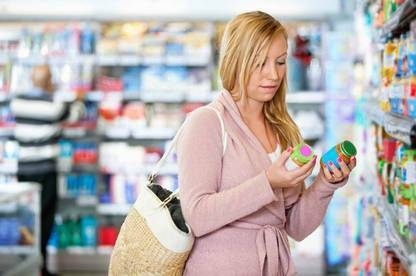 The way information is presented in supermarkets makes comparing products hugely difficult. Unit prices should make it easier to compare apples with apples. They show the cost per unit of measure – for example, per 100g – so you can tell whether a big box of cereal is better value than a small one (see "Is bigger better? ", below) or whether one brand is cheaper than another. Both the big supermarket chains have voluntarily introduced unit pricing. However, the way this information is presented makes comparing products hugely difficult. The biggest problem we found is that unit prices are often displayed in very small type – much smaller than the retail price. Our shoppers often had to peer closely at shelf labels to read the unit price. If you didn't know it was there, it’d be easy to miss. Unit prices are usually shown per 100g or per 100ml. Confusingly, that's not always the case: for example, we found prices for cheese shown per kg. For some products, a measure wasn't given at all. A 25g packet of Continental Onion Gravy had a retail price of $0.83 and a unit price of $0.33. We calculated $0.33 was the price per 10g. But shoppers would have to work this out themselves because the measure wasn't shown on the shelf label. We also found unit prices weren't always displayed. A 700g packet of roasted almonds had a retail price but no unit price (we found the smaller 350g bag worked out cheaper per 100g). A pre-packaged tray of courgettes had a retail price of $6.49 but without a unit price it was harder to work out whether this was better value than buying loose courgettes for $11.99 a kilo. We also found “specials” were often displayed without a unit price. Research shows unit pricing can save consumers money and also stimulate competition between retailers. 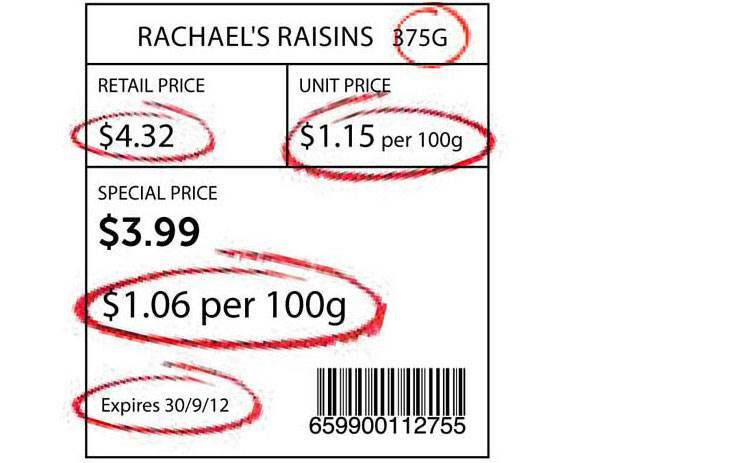 A recent trial by the Queensland University of Technology found that shoppers armed with unit-pricing information saved on average 11 percent of their grocery bill. Unit pricing is mandatory in Australia and study co-author Dr Gary Mortimer says it's "particularly useful" for comparing basic consumables, which make up the bulk of the weekly grocery list. Taking unit pricing into account when shopping definitely helps consumers save when they hit the cash register, he says. But how retailers display unit prices has a significant impact on whether consumers can readily use the information to compare products and make these savings. A frequently cited US study published in the Journal of Retailing found retailers can influence consumers' awareness of unit pricing by manipulating price prominence. The study concluded shoppers pay less for goods when unit prices are prominently displayed. But when unit prices aren't prominent, consumers are more likely to miss out on savings. The wide variation in pack sizes – another trick of the trade – heightens this risk because it makes price comparisons more difficult. In our survey of 75 mueslis, product weights ranged from 350g up to 1kg. Even within brands where products were packed in the same-sized box, weights and prices varied widely. Regulation of unit pricing is becoming more common. 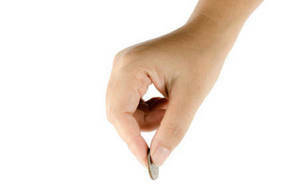 Unit pricing is mandatory in the EU and in several states in the US. Australia introduced mandatory unit pricing for large grocery retailers in 2009. Supermarkets there have to ensure the unit price is prominently and legibly displayed. They also have to show unit prices in print ads and on their websites. Ian Jarratt from the Queensland Consumers Association (QCA) says unit-pricing rules have resulted in major benefits for consumers. A survey carried out by QCA and the Australian consumer organisation Choice found a majority of shoppers at the two main supermarkets thought unit-pricing was useful, although many saw room for improvement in how the information was displayed. Despite the potential benefits of unit prices – especially for cash-strapped consumers – there are no rules on this side of the Tasman. From what we've seen, prices aren't as prominent or as legible as they should be. Consumers are likely to be missing out on savings as a result. Buying bigger packs and heading for the bulk bins isn't always the way to save money on groceries. A 2kg packet of Kings Choice Basmati Rice was advertised at Countdown for $7.84. That works out at 39 cents per 100g. But a 1kg packet cost $3.69 – 37 cents per 100g. A 1.5kg bag of Champion High Grade Flour worked out cheaper than a 2.5kg bag of Edmonds. The Champion flour cost $2.46 per kg while the Edmonds was $2.80 – a saving of 34 cents. A 500g container of Arataki Manuka Honey was priced at $12.49 ($2.50 per 100g). But a smaller 250g container cost $5.69 ($2.28 per 100g). Buying two 250g containers would work out $1.11 less than buying a single 500g tub. A 700g bag of Milo worked out cheaper than buying a 900g tin. The 700g bag cost $9.99 or $1.43 per 100g. At a retail price of $13.49, the 900g tin cost $1.50 per 100g – 7 cents more expensive per 100g. A 4-pack of Earthcare toilet paper on special for $1.49 (37 cents per roll) was also cheaper than buying the 12-pack on special for $4.99 (42 cents per roll). A 700g bag of Value Pack Roasted Unsalted Almonds at a Pak'n Save store had a retail price ($19.98) but no unit price. Buying a smaller 350g bag turned out to be better value: $2.69 per 100g versus $2.85 per 100g for the 700g bag. "Quantity surcharges" – paying more for larger sizes – are much easier to avoid when unit prices are prominently displayed. Buying bigger packs makes sense when it's cheaper. But it's a false economy stocking up on items you're not going to use and may end up throwing out. Pre-packed fruit and veg often don't have a unit price, making it harder to tell at a glance whether they're better value than buying loose. Sometimes they can be but not always. A pre-packed bag of tomatoes was priced at $6.88 for 750g. That worked out at $9.17 per kg, cheaper than buying loose for $10.98 per kg. But other pre-packed items were more expensive. A tray of pumpkin pieces weighing 400g was priced at $3.98 – a whopping $9.95 per kg. Half a pumpkin cost $1.72 a kg. A 400g pre-packed bag of button mushrooms for $5.98 worked out more expensive than buying loose. Per kg, the pre-packed bag was $14.95 compared with $11.98 per kg for loose mushrooms. Weight/volume of product should be clear. Unit and retail prices should be in the same size type. “Special” price offers should show the special unit price and include the date the offer expires. Supermarkets need to make unit prices more prominent and reduce their use of different measures. Unit prices should also be displayed online and in print ads. Overseas experience shows regulation may be the best way to ensure consumers get the full benefits of unit prices.